This five-ingredient dessert from Parents magazine is made with protein-rich Greek yogurt. 1 1/2 cups nonfat Greek vanilla yogurt, drained in cheesecloth or fine-mesh strainer over a bowl overnight in the refrigerator. Place the strained yogurt in a large bowl. Add the honey, orange juice and vanilla and stir well to combine. 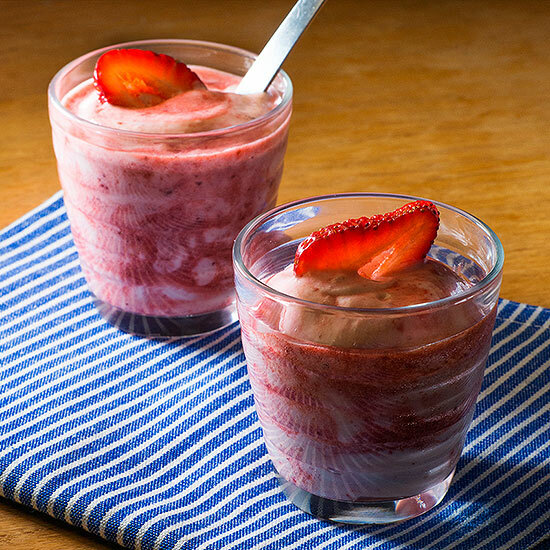 Place the strawberries in a blender or food processor and puree until smooth. Using a spatula fold in the pureed strawberries, creating swirls. Taste for sweetness, adding more honey if desired. Divide the mixture between 4 glasses or bowls. Top with a berry slice and serve. Makes 4 servings. Prep time: 20 minutes.